Whether your pushing it on the track or just driving on the road, your brakes should be performing at their best, and the best means AP Racing. The same company who continuously supplied championship winning teams in Formula 1, NASCAR, LeMans, FIA GT, ALMS, LMES, Grand Am, Super GT, BTCC, DTM, etc. In nearly all types of serious motor racing around the world, AP Racing gets the call more often when only the best will survive. When Ultima Sports needed a brake system for their multiple world record holding 200mph street-driven Ultima GTR super car, they knew who to call. Their all conquering AP Racing equipped Ultima GTR has, for the third consecutive year, smashed the world record for sprinting to 100mph and back to zero again in a gut wrenching 9.4 seconds That is .5 second FASTER than the Bugatti Veyron and a blistering 1.5 seconds FASTER than the Ferrari Enzo! All of this was done in the daily-driven factory demonstrator with street tires and no ABS or traction control! Track professionals understand the need for absolute control. AP Racing understands how to give that same control to your BMW 5-Series! Original Equipment (OE) brake systems do the job they were intended to, stop safely and quietly for the lowest cost possible. After adding performance upgrades, while towing, or just having some fun in the canyons, OE brakes are often overwhelmed by heat when the moment of truth arrives. Big Brake Kits give your vehicle that super car look and feel, while significantly improving your brake performance in two areas. First, larger brake discs increase heat capacity, meaning your brakes will be more resistant to brake fade. Second, stiffer calipers and brake lines increase pedal feel and modulation. 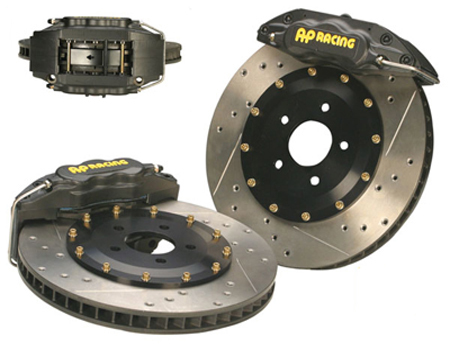 For the biggest brake system upgrade, AP Racing offers 6-piston calipers running on 2-piece rotors. Each kit is designed to work with the original equipment master cylinder, ABS and traction control systems. Specially-designed 2-piece rotors are cross-drilled and slotted, the optimum for high-performance street, autocross and occasional track day use. Slotted-only versions are available for the serious track enthusiast. The curved vane construction provides maximum cooling, while significantly reducing unsprung weight. • High-strength, lightweight, pressure-cast aluminum alloy body. • 2-piece design for maximum rigidity in a street-able caliper. • Fixed radial mount for best pedal feel. • 6 sequential pistons to minimize pad taper and maximize pad area. • Anti-knock back features for a consistent, firm pedal. • Dust seals for everyday driving. • Lug-mount versions available for Pontiac GTO, Holden Monaro & others. • Available in red or black. • Directional curved vanes for maximum cooling. • 2-piece modular design with aluminum alloy hat to handle the heat. • Cross-drilled AND slotted for aggressive pad bite and additional cooling. • Slotted-only optional for heavy track use. • Now featuring the ultimate in high-performance street and track day use. • Virtually fade-free Mintex Xtreme Motorsport Pad Compound. • Consistent coefficient of friction cold to over 1300oF. • Linear response and quick release. • Easier on discs than many current “high-performance” compounds. • Aluminum hat for reduced weight and better thermal conductivity. • Fixed bobbin or full-float mounting. • Curved vane venting for maximum internal cooling. • Cross-drilled and slotted for best street performance. • Slotted-only available for heavy track day use. • 1- piece rotor option available in select kits. Many kits require 17" wheels or larger with sufficient spoke clearance. Download a brake profile template to check your wheels before ordering. Put decades of championship-winning experience on your car.